Lang Park refers to the original name of the site on which a major sports complex now sits, with the main facility either known by its sponsorship name of Suncorp Stadium or the Brisbane Stadium during Asian Football Confederation matches due to conflicting rules on naming rights. Lank Park as a location was established way back in 1914 on the former site of a cemetery, and was initial designed to be a multi-purpose Sports Arena with football just one of the many activities which occurred in the Park along with Cycling, Athletics and Aussie Rules Football. In 1957 the lease of the park was taken over by the Brisbane Rugby League Association, and it became the home of Queensland, who to this day still play at the stadium. The Rugby legacy of the Suncorp Stadium was enhanced when it hosted the 2008 Rugby League World Cup Final with Australia losing to bitter rivals New Zealand 34 points to 20. In 1994 Suncorp-Metway Limited, Queenslands local financial institution attained naming rights of the stadium, and this commercial windfall helped spark the $280 million redevelopment project of the ground, with the Suncorp becoming a state of the art 52,500 all-seater rectangular stadium. As a result of the Queensland Floods which seemed to plague the city between 2010-2011, Suncorp was damaged when the flooded pitch shorted a circuit in the transformer room resulting in a an electric fire. Although major damage was prevented, sports teams were forced to relocate stadiums until repairs were carried out – an inconvenience which affected Brisbane Roar’s on pitch performance. 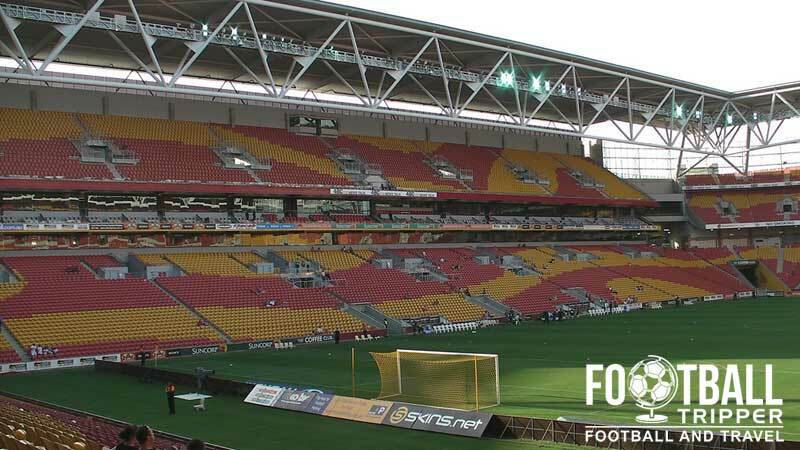 Today, newly established A-League side Queensland Roar play their matches at the Suncorp Stadium, marking the grounds transition from Rugby Venue to multi-purpose stadium, with some journalists making favourable comparisons to Cardiff’s Millennium stadium. Suncorp Stadium consists of the following four stands: North, East, South and West. 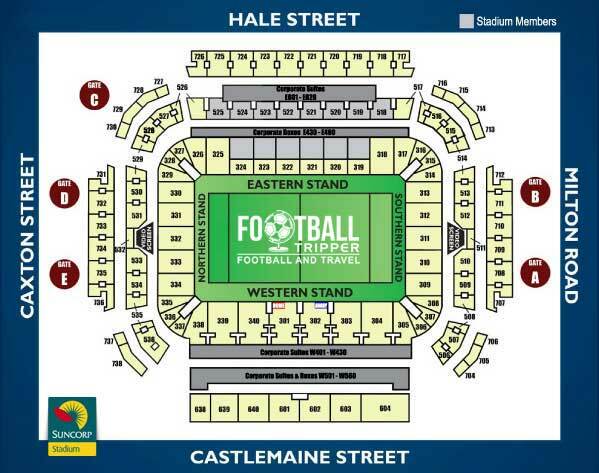 Travelling supporters are usually housed within block 317 which is located within the lowest tier of the south-east corner. Located fairly close to the centre of Brisbane you shouldn’t feel too rushed to make it the stadium which allows you to visit some of the many pubs dotted around en-route to The Suncorp such as The Guilty Rogue, The Grosvenor on George, and the Pig N Whistle British pub. Five minutes Northwest of the ground there is the popular Paddington Tavern, and the Kettle and Tin. When you get to Suncorp itself pints of draught beer will set you back around $7.50 bucks once inside the stadium with wine and spirits both slightly more expensive at $8.00 and $8.60 respectively. Inside the ground there are over 24 outlets which both food and beverage can be purchased from located on levels 3, 5, 6 and 7 with an additional 32 places to grab a beer from. Prices start from around $4.90 for a pie or pastie and increase up to around $10.10 for fish & chips. In addition to the various merchandise kiosks which the club operate on matchdays fans can now purchase Brisbane Roar goods by visiting the clubs newly launched online store. 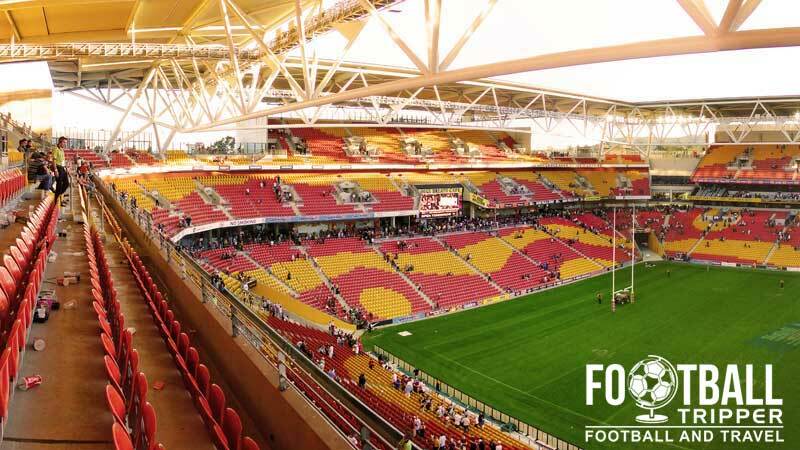 Tours of the facilities at Suncorp Stadium are available to the general public once a week on Thursdays at 10.30 am subject to availability, and assuming the booking has been made 24 hours in advance. For more information and to book your place on the tour you can either visit this page, send an email to [email protected] or phone the administration office on 3331 5000. The bright orange colours of the Brisbane Roar with the equally bright Suncorp Stadium in the background. Please note that the above ticket prices are illustrative for the 2015 season and do not include booking fee ($4.50) and payment processing fee for some credit cards. 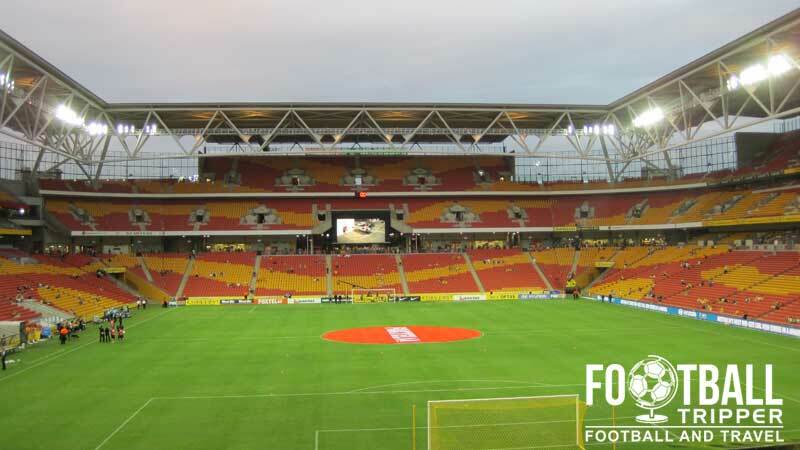 The Suncorp stadium on Lang Park is located on the Northern bank of the Brisbane river approximately 2km from the area around Roma Street Parkland which is essentially the city centre. The main entrance to Lang Park or The Suncorp Stadium as it is now know. This being Australia of course, it must be lined with Palm Trees. Before you plan your journey it is worth noting that your Suncorp Stadium ticket grants you free travel for up to 4 hours before and after the match on the Queensland Rail City Network and Brisbane Transport Bus services which is pretty sweet. Parking restrictions apply across a radius of 1.5km around Lang Park with 15 minute parking limits maximum, with on-the-spot fines issued to offenders. Although there are 100 or so spaces for cars at Bus Bay south of the stadium, you’re better off parking a few miles away out of the restricted zone and catching some of the free public transport. There is a taxi rank located in Castlemaine Street outside the Sports house which in the North-West Corner of the Suncorp Stadium. From the city centre the 2k walk shouldn’t take you any more than 25-30 minutes. All you have to do is follow the path of the Brisbane river until you get to the Go Between Bridge on the South bank/West End and then follow that North to the Suncorp Stadium grounds. Due to a perceived safety risk this colourful sign located at the South Bank has since been removed. It was originally installed as part of the city’s G20 Cultural celebrations in February 2015. The closest railway stations to the stadium are either Milton or Roma Street which are located either side of the stadium, at an approximate walking time of less than 10 minutes. There are numerous bus stops located throughout Brisbane, and on matchdays the frequency of bus services greatly increases to ensure all fans get to the stadium in time for kick-off. In addition to the normal timetabled services around the city there are special matchday shuttle services which depart from across the city including Carindale, Eight Mile Plains/Mat Gavatt, Garden City, Chermside and The Gap. 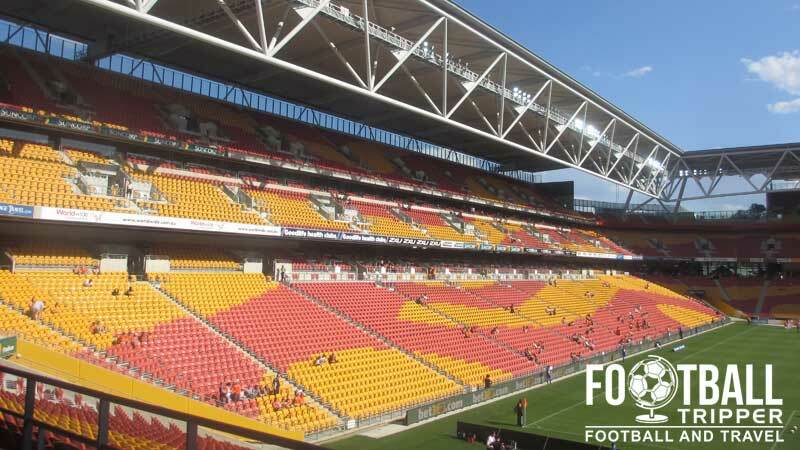 The closest places to Suncorp stadium to stay at are The Caxton Hotel, Gambaro Hotel and the more affordable Brisbane City Backpackers Hostel. Southwards across the Brisbane River there is the Riverside Hotel Southbank, with plenty of options such as the Ibis back towards the city centre near the main railway station.